Subscribe for Alerts about New Project Launches in Nasik. Sai Galaxy - 1, 2 & 3 BHK apartments at Indira Nagar Nashik. Mokksh - Lavishly appointed super premium sky villas at College Road Nashik. Gauri Ganesh Apartment - 1 & 2 BHK apartments at Adgaon Nashik. Shivam Park - 1 & 2 BHK luxurious flats at Panchvati Nashik. Sai Palace Residency - 1 & 2 BHK apartments at Adgaon Nashik. Janaki Residency - 1 & 2 BHK apartments at Peth Road Nashik. Sai Ganesh Park (Ready Possession) - 2 BHK luxurious terrace flats at Wadala Nashik. Ravi Complex - 1, 2 BHK flats and shops at Peth Road Nashik. Indu Heights - 3 BHK apartments and shops at Panchvati Nashik. Aditya Tower - 1, 2 BHK flats at Makhmalabad Road Nashik. Vijay Sankul - 1, 2 BHK apartments at Peth Road Nashik. Samrudhi Palace - 1, 2 BHK flats at Makhmalabad Road Nashik. Vista - 2, 3 BHK apartments at Indira Nagar Nashik. Harmony - 2, 3 BHK flats, 3 BHK row houses at Dwarka Nashik. 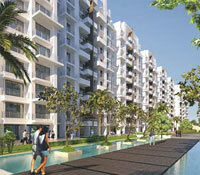 Ekta Greenville - 2, 3 BHK apartments & 3, 4 BHK villas at Mumbai Agra Road Nashik. Amoga Pride - 2, 3 BHK flats at Mumbai Agra Road Nashik. To Search For More Resale Properties Click Here. To Sell or Lease your Property Become a Member. Mumbaiproperties.info - Mumbai Properties and Real Estate Information Portal. Studyinpune.com - Information on Education in Pune and various aspects of studying in Pune. and thrice for commercial premises. Nashik also boasts a SEZ in Sinnar which is unique in supporting mulitiple products and it also comes as one of the cities under the (JNNURM) Jawaharlal Nehru National Urban Renewal Mission.